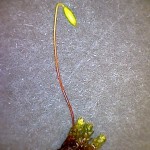 The type genus Bryum is notoriously challenging (sometimes called the “Carex” of the bryophytes), especially difficult if there are no capsules present to help with the ID (like sedges without the fruits!). Here Dr M restricts himself to three of the common and more easily identified types. The leaves have been described as plurifarious which is a difficult word to track down in the dictionary, and probably refers to the characteristic leafy shoots which are composed of many spirally arranged leaves. The leaves are ovate, lanceolate or spoon shaped (spathulate), with prominent central nerve (midrib or costa are other words meaning the same thing) and often dentate and sometimes bordered with a perimeter row of distinctive cells, discernible with the hand lens. If present the capsule is held on an elongate seta, and is globose, ovate or with pear-shaped (pyriforme) neck, usually pendulous, the lid mamillate (breast-shaped), only rarely beaked. The calyptra is hooded, smooth and narrow and rapidly disappears (fugacious is a word used to describe this transient state). 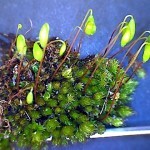 Bryum is the type genus, but Bryales includes also the large woodland acrocarps such as Mnium, Plagiomnium etc. 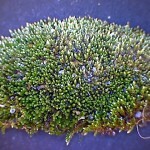 Bryum argenteum – in truth this is Dr M’s favourite plant, a real silvery bryological cutie! It grows almost anywhere and everywhere; northern and southern hemisphere, the tropics, the temperate and the arctic zones. In Britain you can find it in those places where little else grows or can grow, in cracks and crevices in tarmac, on bollards and at the edge of pavements and kerb-stones. 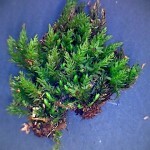 The short, upright shoots grow densely-packed together and the ovate, concave leaves lend a catkin or conifer-like appearance to the shoots, and this together with the silvery-grey colour, make Bryum argenteum an easy species to recognise. 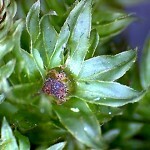 The capsules are common and typical Bryales form; ovate, nodding and with a distinct mammilate lid. 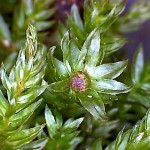 Bryum capillare – one of the most common and abundant of the British moses forming dense tufts notable for the corkscrew-like spiralling of the leaves when dry. 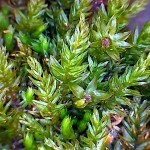 When moist, the plants are conspicuous due to their robust habit, drooping capsules and greenish hair-points to the leaves. 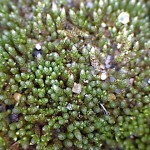 Bryum capillare grows in a wide range of habitats including rocks, walls, roofs, woodland and grassland. 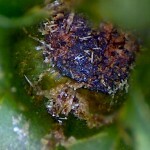 Dry plant showing corkscrew shoots. 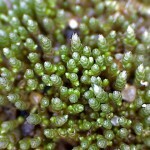 Mnium hornum – A common and robust woodland moss forming dull green (when older) and bright green (when young) tufts and carpets on soil in woodland with shoots 2-4 cm tall. 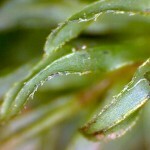 The leaves are oblong-lanceolate, strongly bordered and with a toothed margin with double teeth discernible with the hand lens or dissecting microscope. 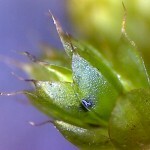 When present, the capsule is pendulous with a short blunt lid and tapering neck. 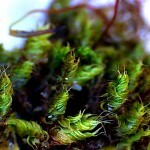 Check out the BBS advanced guide to Bryum species here. 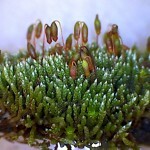 The featured image at the top of this post shows some beautiful capsules of Bryum capillare with the characteristic pendulous Bryales form and mamillate (breast-shaped) lid, a feature which had led some amateur bryologists to coin the nick-name “Booby-licious Bryales”.